Are economic woes a casualty of unexpectedly high costs? 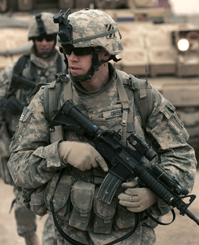 The fifth anniversary of the Iraq War hit just as the subprime mortgage crisis and rising unemployment in the United States were turning the economic situation bleak. Against this backdrop, a Nobel laureate economist and a federal budget expert linked the economic downturn to the war and calculated its eventual total financial cost at $3 trillion and possibly even more, plus the tens of thousands of Americans and Iraqis killed or wounded. President George W. Bush dismisses the linkage argument, contending the war creates job opportunities at home and that military spending in Iraq and Afghanistan amounts to only a "modest fraction" of the U.S. economy. But even Republican lawmakers have been asking why taxpayers are funding much of the rebuilding of oil-rich Iraq while it reaps billions in profits thanks to record-high oil prices. For its part, the administration says Iraq is now starting to bear more of the reconstruction costs.